When you know who attended your motorsports event last year, it’s easy to make advance ticket sales. But when you don’t know who attended, your advance sales aren’t growing fast enough. If that’s the case, you should consider using ProQ Motorsports Event Software. ProQ is designed to help you grow any motorsports event, and to help you increase ticket and merchandise sales. It was designed by a RACER for other RACERS to use. Are you using e-newsletters to increase sales? Is is easy? Is it working for you? Get ProQ, start sending emailed newsletters and you’ll see that it works! 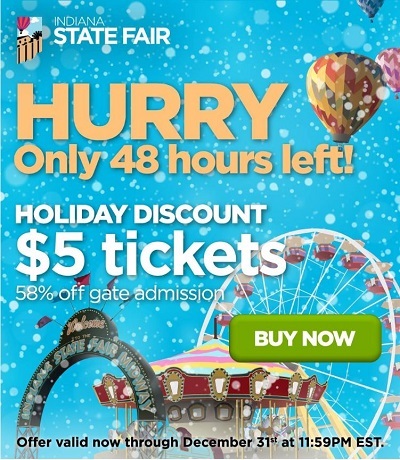 For a great example of pre-sales, look at this ad for the Indiana State Fair (ISF.) The organizers emailed this ad to everyone who bought tickets online last year. The offer is such a low price it’s hard to not buy now, especially when you’re taking the whole family next year. AND they created a sense of urgency by putting a deadline on the offer. They probably got good advance sales from this ad. Of course, they can resend it later with a different offer to those people who don’t buy this time. They might buy the next offer as the event gets closer. Maybe the next email can sweeten the deal by offering discount merchandise for early buyers. Another idea would be a free ride coupon for the trolley with each ticket. The only limit their imagination, so they can keep sending it out periodically to the remaining non-buyers and adding dollars to their income. What you need is (1) software to keep track of people, (2) software to track the online sales, and (3) software to send out email marketing. Maybe you could put it in a spreadsheet and import/export the data across those three. OR – you could get the one motorsports event package that does all that and more – ProQ Motorsports Event Software. Don’t buy multiple single-use apps – get the one that does it all! Advance ticket sales should not be difficult, and it should get easier each year. You just keep using the same database of previous purchasers and add the new ones. There is no reason that pre-sales shouldn’t grow and grow and grow. ProQ helps you by automatically adding names and addresses to the database from the WEB FORMS the program offers. You just create a simple ticket sales web form, add it to your web page, and the customer enters all their own data. Your staff doesn’t have to do any of that, reducing your labor cost and reducing mistakes. It also helps because it has a built in NEWSLETTER capability so you can create ads like this one easily. You can easily segment your CONTACTS into interest Groups, and send different newsletters and ads to each group. If you want to increase your advance ticket sales, let us help you. Contact us today at 317-299-RACE and we’ll show you how! Dragstrip and Speedway Directory – Are You Listed? What Important Activities Will You Do Today?